As a librarian I am always promoting the library on or off the clock. One day I recommended to a friend that he try out the audiobooks one can download from the library’s website. “Why do you listen to audiobooks?” he asked me with suspicion. “Isn’t that cheating?” He maintained that reading the print version of the book was the correct way. “How is it cheating?” I countered. “Nearly all audiobooks produced these days are unabridged. If you listen to the audio version as intently as you read the print version you still will have a similar experience. Instead of using your eyes to process the information you use your ears. In some ways audiobooks might give you more of a boost. There is research supporting the use of audiobooks. An article written by two librarians says research “repeatedly indicates that listening to audiobooks enhances comprehension, fluency, vocabulary, and language acquisition, as well as overall reading achievement” (Grover and Hannegan). I went on with my explanation. “Audiobooks have changed the way I read. I still read the old-fashioned way. But now I find time to listen when I can’t read. With audiobooks I can cover more ground. For instance, when my son takes his nap and I have housework, I listen to audiobooks. When I am outside raking leaves, I listen to the story of the man who compiled the Oxford English Dictionary. During those long car rides, I listen to an author contest conventional wisdom regarding parenting. When I cook and prepare food, I listen to a narrator describing the Maginot Line in France during WWII. “I’m glad you brought that up. What many people don’t realize is that people can download audiobooks from their public library website for free. The Sails Library Network serves 73 Libraries in 40 communities throughout Southeastern Massachusetts. The Sails Library Network as well as the Ocean State Libraries Consortium offer both eBooks and audiobooks to download. Grover, Sharon and Lizette Hannegan. “Hear and Now: Connecting Outstanding Audiobooks to Library and Classroom Instruction.” Teacher Librarian 35.3 2008: 17. MasterFILE Premier. Web. 21 Feb. 2013. Michael Cardin, MLIS, is the Young Adult Librarian at the East Smithfield Public Library in Smithfield, RI. This year’s Teen Summer Reading Program will be the seventh that he has planned and carried out. There is no doubting the importance of literature in the day-to-day lives of prison inmates. In a world obsessed with television, celebrity gossip, and social media, inmates are, save for a few hours a day, almost exclusively removed. Books can fill the long empty days, provide an escape from the drudgery of prison life, and help them better themselves and learn new things. Perhaps even more important, however, is the impact that prison inmates themselves have had on literature. Some of the greatest literary achievements in history, both fiction and non-fiction, were conceived or penned by authors while in prison. There are far too many of them to create an exhaustive list, but here are some of the most notable. This two-part volume fully titled “The Ingenious Gentleman Don Quixote of La Mancha” is widely considered one of the greatest and most influential works of fiction ever published. Author Miguel de Cervantes is said to have formulated the story while in prison at Argamasilla de Alba in La Mancha. Some hold that Cervantes wrote the first volume while incarcerated, but there is no debate that his time behind bars was the inspiration for the story. Martin Luther King, Jr. wrote this letter from his jail cell after being arrested for his participation in the Birmingham campaign, a non-violent protest against racial segregation. The letter contained King’s famous statement “Injustice anywhere is a threat to justice everywhere.” While the letter had little effect on the campaign in Birmingham, its widespread circulation is credited for rallying support for the civil rights movement and calls for civil rights legislation. King’s work remains one of the most important documents in American history. Divided into four books, The Travels of Marco Polo chronicles the experiences of Marco Polo throughout Asia, China, Persia, and Indonesia between 1271 and 1291. Polo recounted his travels to Italian romance writer, Rustichello da Pisa while the two were imprisoned in Genoa. Although the voracity of the work was regarded with suspicion at the time, today topographers have referred to his work as the precursor to scientific geography. Sir Thomas Malory, the father of the King Arthur mythology, is said to have written the most famous version of the legend, Le Morte D’Arthur while incarcerated in France. The book created the famous imagery of the sword in the stone and the lady in the lake, and has been re-imagined over and over throughout history. This photo of writer Oscar Wilde was taken by Napoleon Sarony in January, 1882 and is currently held by the George Eastman House. 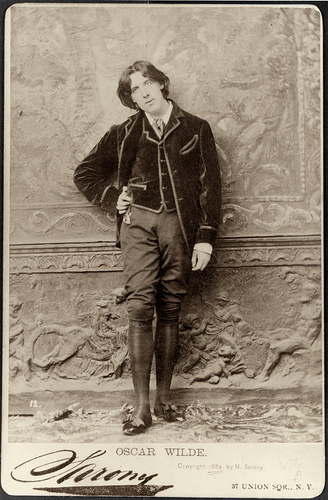 Better known for publishing works like “The Picture of Dorian Gray” and “The Importance of Being Earnest,” Oscar Wilde was an Irish writer who became one of London’s most popular playwrights in the in the early 1890s. However, Wilde was convicted of gross indecency in 1895 and sent to prison. While in jail, he wrote what amounted to be the longest love letter ever written, a work that was published posthumously under the title, “De Profundis” (“From the Depths” in Latin). Often overlooked, De Profundis gives tremendous insight into the character of Oscar Wilde, his affection for others, and his legendary conversational skills. There exist countless other works created or inspired by authors who spent time in prison. There is no direct correlation as to why so many important pieces have been spawned by the incarceration experience. Perhaps, it is due to the amount of time allowed for introspection or the fact that so many people in history were jailed for what they believed in (Nelson Mandela and Ghandi also come to mind). What is clear, however, is that the next great literary work is being written somewhere right now, quite possibly in a prison cell. Brian Beltz is an aspiring writer and currently blogs for the law firm Solomon & Relihan (www.solomonrelihan.com) in Phoenix, Arizona. He loves to help make sense of complex legal issues in plain English and write about current events. For those who love to read, Wattpad.com has a lot to offer. It is a location where writers and readers come together and share stories for no other reason than because a story needs to be told. Genres of all kinds reside on this popular website and there is easily something for everyone within its pages. There is also a community mindset amongst its readers and writers. The site covers a wide range of likes and interests and has many clubs available to those who love to read. You’ll find a collection of links to Wattpad’s many available clubs by going to the site’s Community drop down menu then selecting Clubs. These clubs are full of people interested in specific motifs. The “Newest Club Discussions” are posted on the top left of the page and feature recent comments. You’ll find breadcrumbs on the bottom of each comment giving you the link to the specific club. The featured clubs are popular or otherwise deemed to be in the featured list. Thousands of members reside in these clubs covering a wide range of topics from “Essential Reads” to “Share Your Poetry.” Each club has a short description of what it’s about its number of members. It’s not uncommon to see clubs with tens of thousands of members. These clubs are more generalized than some of the others, but see a great deal of visitors. The longest of the club lists belongs to those under the Categories section. Each category of written content on Wattpad is listed here broken down by genre. Although fewer members reside in each of the clubs under this section, these clubs have membership ranging from 1,000 to more than 30,000 members. As Wattpad covers such a diverse range of content, there is a club available for nearly anyone. One of the most interesting areas belongs to “Fan Fiction.” Wattpad allows submission of content based on nearly anything you are a fan of. For example, you could write that “Star Trek: The Next Generation” story you’ve always wanted. Since there is no money being made from the project, there are no copyright laws or official red tape to worry about. Coincidentally, more than 16,000 members belong to this specific club. Wattpad.com is more than just a site to acquire free reading material. It is a place where anyone can share their stories for all to read and receive feedback from those who read them. Beginner authors post their works in order to practice as they receive insights about how the public gauges their performance. It is a place where others can share knowledge, book ideas, character building, and more. Community clubs are developed and frequented by the readers and writers of Wattpad sharing ideas on a global scale. No other site is quite like Wattpad.com. Blogging was a natural progression for Allison Foster once she graduated from college, as it allowed her to combine her two passions: writing and children. She has enjoyed furthering her writing career with www.nannyclassifieds.com. She can be in touch through e-mail Allison.nannyclassifieds@gmail.com. In this video, J.C. Wallace portrays the complex role of Hamlet. “To be, or not to be” is one of the best-known lines in English literature. Wallace gives a superb performance of Hamlet’s greatest soliloquy. Wallace is the founder of the Rhode Island Shakespeare Company and has portrayed Hamlet for the Little Theatre of Fall River. This video was produced by JoAnne Breault, Director of Communication for Changing Lives Through Literature (CLTL). Breault oversees CLTL’s Literature Transforms You campaign which promotes reading literature as a way to enhance lives. CLTL is based at the University of Massachusetts Dartmouth and was founded by Dr. Robert Waxler and Judge Robert Kane as an alternative sentencing program. This is the second video in the Literature Transforms You series. Watch the first video—The Tell-Tale Heart. Please comment on this post to share how literature has transformed you (or someone you know).